A new 200-million cubic feet per day (MMcf/d) natural gas processing facility – the Demicks Lake plant and related infrastructure – in the Williston Basin. “With more than $4 billion of announced capital-growth projects since June 2017, we continue to build off of our significant asset footprint,” said Terry K. Spencer, ONEOK president and chief executive officer. 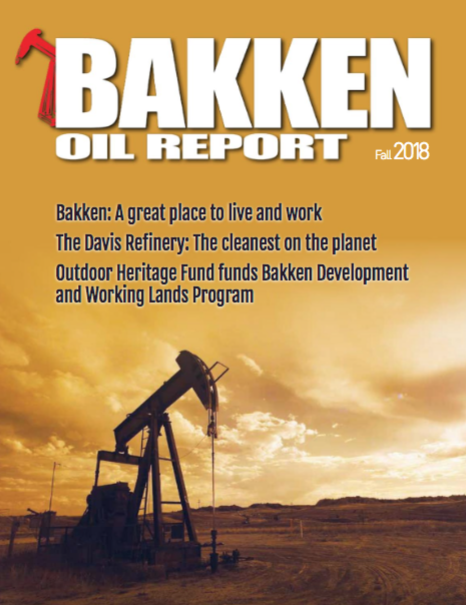 “The Arbuckle II Pipeline and MB-4 fractionator will help meet the needs of NGL producers in all of the basins where we operate, including the STACK and SCOOP areas and the Denver-Julesburg, Powder River, Williston and Permian basins,” said Spencer. “These strategic projects complement our recently announced Elk Creek pipeline, increasing ONEOK’s ability to deliver NGLs from the Rocky Mountain region to growing markets in the Gulf Coast. “The Demicks Lake plant will provide critical natural gas processing capacity to accommodate increasing Williston Basin production, helping producers meet natural gas capture targets in North Dakota,” added Spencer. These projects are expected to generate adjusted earnings before interest, taxes, depreciation and amortization (adjusted EBITDA) multiples of four to six times. Following ONEOK’s recently completed equity issuances totaling approximately $1.6 billion, project funding is expected to come from cash generated from operations and short- and long-term borrowings. ONEOK does not expect to issue additional equity in 2018 and well into 2019. 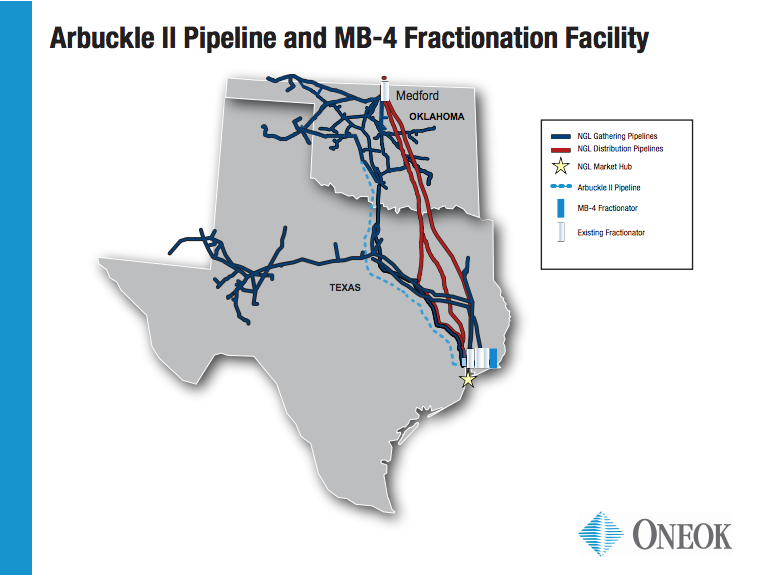 The approximately 530-mile, 24- and 30-inch diameter Arbuckle II Pipeline is expected to cost approximately $1.36 billion and will have an initial capacity to transport up to 400,000 bpd of unfractionated NGLs originating across ONEOK’s supply basins and extensive NGL gathering system to the company’s storage and fractionation facilities at Mont Belvieu. The Arbuckle II Pipeline is expected to be completed in the first quarter 2020. The pipeline will have the capability to be expanded up to 1 million bpd with additional pump facilities, which could more than double ONEOK’s current capacity between the Mid-Continent and Gulf Coast. The new MB-4 fractionator and related infrastructure, which includes additional NGL storage capacity in Mont Belvieu, are expected to cost approximately $575 million and be completed in the first quarter 2020. ONEOK’s total NGL fractionation capacity will increase to 965,000 bpd following the completion of MB-4. The initial capacity of the Arbuckle II Pipeline is more than 50 per cent contracted, and MB-4 is fully contracted. Both are anchored by long-term contracts with terms ranging between 10 to 20 years. Adjusted EBITDA multiples for these projects are based only from these commitments but additional supply agreements continue to be negotiated. The Demicks Lake natural gas processing plant and related field infrastructure are expected to cost a total of approximately $400 million and be completed during the fourth quarter 2019. 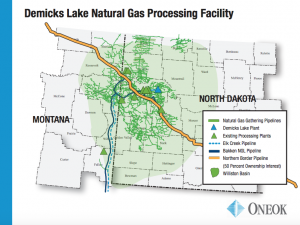 The Demicks Lake plant will be built in McKenzie County, North Dakota, which is in the core area of the Williston Basin. The plant is supported by acreage dedications with primarily fee-based contracts. The Demicks Lake plant is expected to contribute additional NGL volumes to ONEOK’s NGL gathering system and natural gas volumes to ONEOK’s 50 percent-owned Northern Border Pipeline. 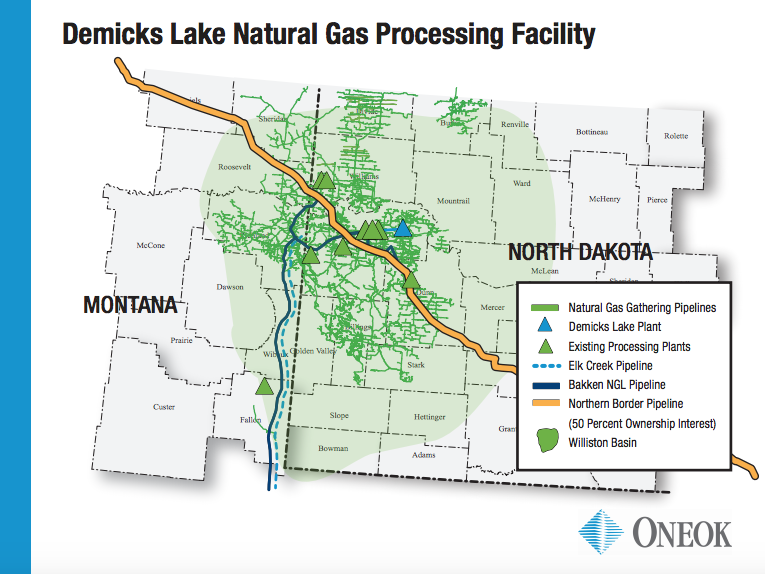 ONEOK’s Williston Basin natural gas processing capacity will increase to more than 1.2 billion cubic feet per day following the completion of the Demicks Lake plant.